The symptom called Lhermitte's sign is not well known by those who don't suffer from it. For women who are about to end their reproductive years, not much may be found as to why it occurs, causing confusion and frustration as they search for effective management techniques. Continue reading to learn more about Lhermitte's sign, including causes, symptoms, and treatment options for that long-sought-after improved quality of life. Lhermitte's sign is an electric shock sensation that is identified as a type of neuropathic pain. The shock radiates from the back of your neck down your spine, occasionally transcending into your arms, fingers, legs, and toes. Generally, the condition is triggered by bending your head forward, garnering its other name of the barber's chair syndrome. It is also known as Lhermitte's syndrome. Lhermitte's sign is often caused by multiple sclerosis (MS), an autoimmune disease causing damage to brain nerve cells, ultimately leading to impairment of speech, muscular coordination, numbness, and more. However, Lhermitte's sign not from MS also occurs in those suffering from vitamin B12 deficiency, spinal cord compression, disc herniation, trauma, high-dose chemotherapy, lupus, and more. Moreover, the symptom can be exacerbated by hormonal imbalance. How is Lhermitte's Sign Related to Menopause? 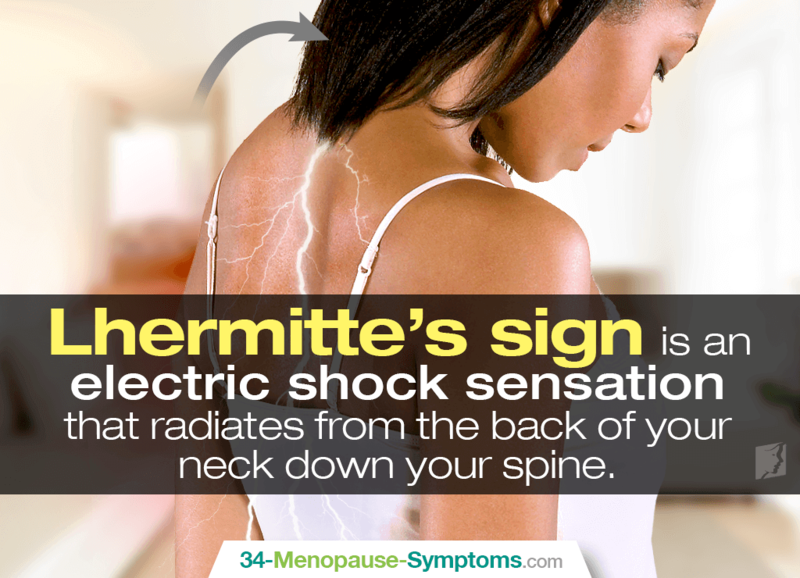 Women passing through menopause can experience electric shocks similar to those of Lhermitte's sign. While the exact mechanisms behind menopausal electric shock sensations are yet to be fully understood, it is believed that drastically fluctuating levels of estrogen affect nerve tissues, thus causing sudden electric zaps. What are Some Symptoms of Lhermitte's Sign? Lhermitte's sign symptoms are easily distinguishable, as they fall right in line with the definition. Lasting for a few short seconds, the electric shock sensation of Lhermitte's sign can be intense and almost debilitating. It is often compared to what it feel like to be jolted or electrified, similar to a sharp vibration. The sensation lasts for a few seconds or minutes, and it can come and go over time. How Can I Treat Lhermitte's Sign? Lhermitte's sign is not often treated as the pain does not last long enough for pain medications and treatments to be of effect. Therefore, manage Lhermitte's sign during menopause by striving to prevent the reoccurrence of electric shock sensations by resolving the underlying cause of hormonal imbalance. How Do I Manage Lhermitte's Sign? Create an internal environment conducive to hormonal equilibrium. Start with enacting some simple lifestyle changes of optimizing your diet with phytoestrogens - found in tofu, lentils, beans, apples, etc. - to fill the hormonal gap as well as partaking in regular exercise to support endocrine system functioning. Also, consider the use of alternative medicines proven to promote hormonal balance, including phytoestrogenic supplements - black cohosh, chaste tree berry, etc. - and hormone-regulating supplements, such as Macafem, which work with the endocrine system to prompt its own hormone production. Check out further electric shock sensation treatments for hormonal imbalance to find one that will work for you. Lhermitte's sign - also known as barber's chair syndrome or Lhermitte's syndrome - is an electric shock sensation starting in the neck and radiating its way down the back. Although Lhermitte's sign and MS go hand in hand, the condition is actually caused by a variety of health conditions. In menopausal women, electric shock sensations similar to those of Lhermitte's sign are caused by the drastic hormonal fluctuations experienced as fertility comes to an end. The shock itself is not often treated since it is short-lived, but menopausal women can choose from numerous treatments options to finally find hormonal balance, involving dietary, habit, and supplement changes. If you have ever experienced lightening-like jolts in your head, you know they are not pleasant. Learn everything you need to know about brain zaps.